Thanks to my student, Jae, from my Women's Studies classes at PSU, former members of the unique Women's Theater Company reunited to talk about adventures we had in the old days. The group was active from the early 80's through the early 90's and played to packed houses the whole time. Jae is doing an extensive project on Social Change theater in Portland. I had mentioned to her when she interviewed me for this project, that I had been a member of the WTC in the mid-80's, as had my partner. My daughter appeared in one production in about 1990. Jae was very excited to hear about this company, as she hadn't heard anything about it having existed. Through talking to Jae and meeting last night with the old group, I came to realize how unusual and significant this theatrical group had been, how fortunate I am to have been part of it! My partner and I were living in Salem when we first heard of this outrageous group in Portland. 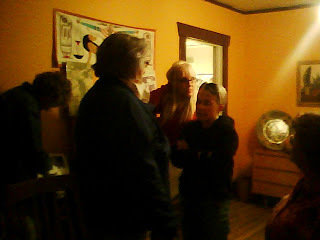 They were putting on new plays with all women casts that featured Lesbian relationships and promoted feminist ideals. When we moved to Portland in 1983, we found this group as soon as we could. I was in my first production in 1985, where I played a homophobic sorority girl, secretly in love with the main character. 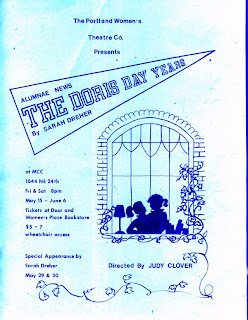 The name of this play was "Alumnae News: The Doris Day Years", written by East Coast playwright Sarah Dreher. Sarah also wrote Lesbian themed novels and was an outspoken advocate of women's and gay rights. A highlight of the run of the play was when Sarah came to Portland to see the show. In these days of so much acceptance of equality for women and gays, (yes, I know, we're still struggling) it is hard to remember how brave it was for this band of young women to mount feminist and gay positive plays. We did it on a shoestring, too. No grants for this group; just a lot of finagling and determination. I missed the early years of the group where they moved from theater to theater, scraping up rent and having to take the set down every night after performances. I enjoyed hearing more about this time last night. Several of the group remembered how they took movement, dance, and improvisation classes. When Jae asked why they did all this work, one of the group replied, "We were in love. We were in love with our art and our community." When they first began, the group called themselves "A Real Professional Women's Theater Company." One of the early productions was a feminist Nancy Drew mystery. 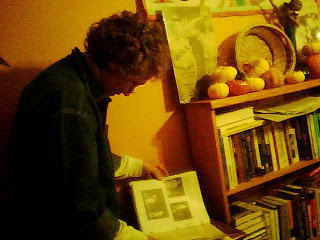 I was delighted to find that one of us has been a dedicated archivist, and that she had brought copies of all the posters. The posters are quite cool, especially if you consider they were made before computers were part of our lives. Company members designed, printed, and distributed them. They also made their costumes, sets, handled lighting, props, the ticket sales, etc. All in their spare time, because everyone had a day job or two. By the time my partner and I joined, the Company had a permanent home in the Hollywood District. It was a ramshackle building, and we lived in fear of the Fire Marshal. Members with carpentry talents not only built the sets, but also made alterations to the building to improve it as a theatre and to keep said Fire Marshal happy. Sometimes there was friction in the group, and the company had a hiatus for a while before I joined. Community won out, and after most members had started therapy, they came together again to mount more productions. 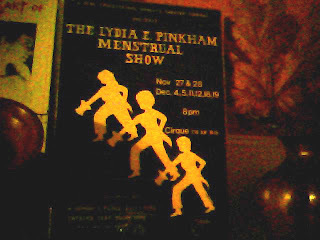 Before my time, the group took tap dancing lessons so they could put on "The Lydia Pinkham Menstrual Show." This might seem a silly title today, but remember than even mentioning menstruation in public was a radical act. The group often made its points through humor, such as using the name of an old patent medicine in the title of this show. 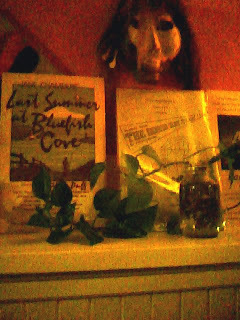 Poster for Last Summer at Bluefish Cove--I was in this one! I'm so grateful to Jae and to all the members of the old Women's Theater Company--thanks for the old memories and the new perspective on this amazing experience!